Yesterday, I posted this picture to Instagram of me and my crew in an aisle full of breakables at Home Goods with a caption that went something like, “Some might call me brave. Some crazy. But we all know what Nola thinks.” (She’s the one sitting down in the basket). And I get that. I do. My kids are NOT calm, quiet little beings. They are–ahem–FULL of personality and energy. Which can translate to some pretty disastrous outings. Plus, since I teach fitness classes in said 30-minute-away town, I like to combine my trips as much as possible, which means that I’m often spending several hours at a time out and about with 6 kids in tow. MOST of the time, though, it’s really not that bad. Certainly, we have our share of bad attitudes (mine’s usually the worst), toddler meltdowns, diaper blowouts, and the other usual casualties of hauling small children out in public and then requiring them to behave while doing boring things like grocery shopping or returns. But we also have–dare I say it–fun during our outings. (I can hardly believe I just typed that). I’ve been dragging kids along with me on errands for 9 years now, so I thought I might share my best tips for making the experience as manageable and even marginally pleasant as possible. Feel free to skip them if you’ve already got your routine down pat, but if they can help even one person, I figure it’s worth posting. I don’t always remember to do this, but when I do say a quick prayer in the car before we head out on our missions, things always seem to go more smoothly, if for no other reason than that my attitude tends to be better. So, you’ve prayed about “patience and kindness” and all that, but kids can always use a little positive reinforcement and specific instruction, so I like to take a second in the car to remind my kids to “be a blessing” everywhere we go and let them know how they can do that (i.e. opening doors for the stroller or other people, carrying packages into the post office, entertaining their little sisters, etc.). Note: I know how tempting it is to threaten your kids within an inch of their lives with exactly how. much. trouble they’ll be in if they misbehave. I’ve done it plenty of times. But you know what? Kids respond so much better to praise than threats. So, I try to remind my kids of the logical consequences if they act wild and then follow it up with, “But I know you guys will do great because y’all are awesome, and I’ve seen how good you are at being a blessing to others.” (They ALWAYS beam and nod enthusiastically when I say that…which always makes me feel ashamed that I don’t say it more often). OH, and this is a somewhat recent development for us, but in the past year or so, my three oldest (ages 4-9) have definitely developed strong cases of the “Gimmes” anytime we go anywhere with toys. Or gum. Or drinks. Or…anything. 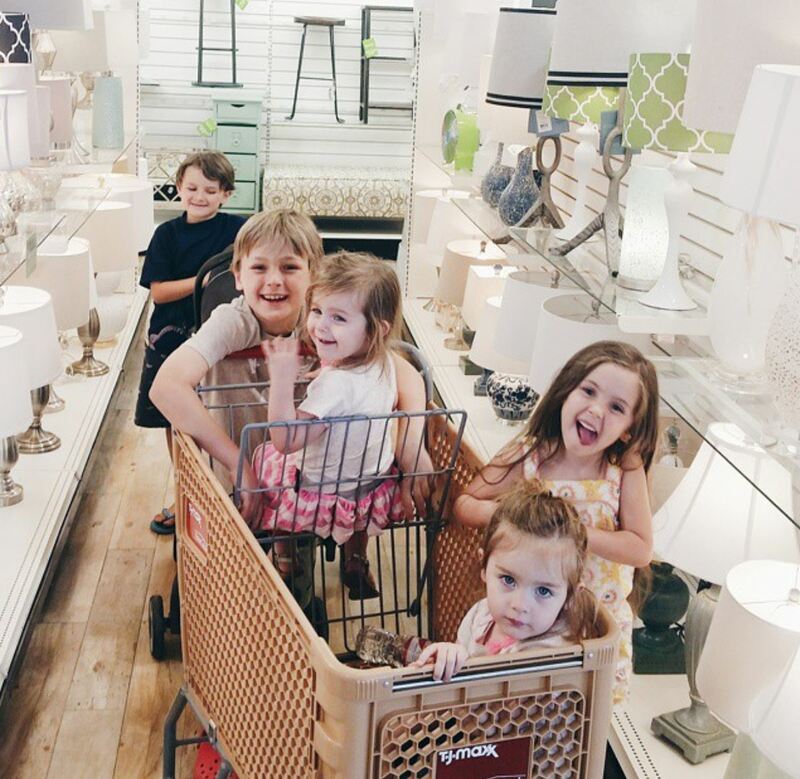 At first, it was a bit of a shock for me because I’m not in the habit of buying my kids “bribes” just to go shopping with me, and I wanted my kids to just quit being such materialistic hedonists, for the love! But then, I came back to planet earth and remembered that I’m mothering little sinners just like me, and I like to buy new things too. My older kids loooooooove it when I tell them exactly how many errands we’re going to do and in what order. I, on the other hand, despise it. Because if, as often happens, we need to change up our game plan, at least one of them will inevitably say, “But, Mama, I thought you said THREE errands in THIS order!” (Insert: sudden spike in my blood pressure). Even so, things usually go better when they have an idea of how long they’ll need to “keep it together” and in what kinds of environments. So, I usually say something like: “We have two errands to run–the post office and the grocery store–before the gym. IF we have time. If we don’t, please don’t correct Mama or worry about it. We’ll get them done another time.” (Because, yes, children sometimes complain, even when you do fewer errands than you warned them about). Seriously, the difference between a failed errand and a successful one can usually be traced back to how prepared I was. Oh, good grief, Abbie. Are you seriously suggesting that I make a game plan for a trip to Walmart? That’s way too much work. Not quite. But if you know you’ll need to do multiple errands in a row–especially with really little kids–having an arsenal of distractions and time-stretchers is pretty key to not losing your ever-loving mind. I haven’t taken regular trips to Goodwill in a while, but I did take 5 kids with me pretty frequently when the twins were younger. And I knew we were going to be there for a minimum of 2 hours each time, so I would plan ahead with levels of distractions. I really think the key to keeping your toddler from losing it during a longish errand is degrees of distractions. Here’s what I mean: when you first enter a store, a little kid will probably be interested in surveying his surroundings and might not need anything else to keep him happy. This could last anywhere from 5-30 minutes, but I usually get about 15, if I’m lucky. When the natives start getting restless, I’ll pull out a snack like pretzels or graham crackers. This buys me another 10-15 minutes. And then, of course, when they’re done with their snack, they’ll be thirsty, so I whip out the juice cups. We don’t drink much juice at home, so even watered down grape juice seems like a big treat and keeps them occupied for a while. Usually, by this point, they’re pretty content to go back to observing for a while since their bellies are full and happy. When, as inevitably happens, the whining starts up, I’ll pull out their favorite portable toy, which almost always swings their moods back in the right direction. Fruit snacks are a big treat around our house and take a while to chew through, so they might make an appearance if necessary somewhere around this point. Depending on how much time we’ve got left and how desperate the situation is looking, I’ll pull out the big guns. SUCKERS. You can do organic or sugar-free or whatever you need to to assuage your mama-guilt, but honestly, we eat these SO rarely that I’m okay with my kids having a Dum-Dum every once in a blue moon. Of course, the genius of suckers is that they take a long time to eat. Last AND least, if we absolutely have to stretch it just a liiiiiiiiiittle bit longer, I’ll pull out my phone and let them zone out to Peppa Pig or play a couple of rounds of Angry Birds. I’m not a fan of using portable screens to subdue my children, so this is definitely a last–but sometimes necessary–resort for me. While this may sound more complicated than it’s worth, I promise that the whole process is much more organic (while still intentional) than it sounds. The main thing I’ve discovered is that spooling out the treats and distractions buys you SO much more “happy time” than simply loading your toddler up with his favorite eats, drinks, toys, and games all at once. He has no idea how to pace himself and will usually spend about a minute on each and then throw them all out of the stroller and be ready to roam. I’m a BIG proponent of teaching kids to do right because it IS right, not because they expect something in return. Even so, it’s always a good idea to show your kids how much you appreciate their help and good attitudes, instead of simply taking both for granted. If we’ve had a week full of errands and “boring” outings, and the kids have been helpful and patient, then I try to plan a trip to the park or the pool or Sonic as a reward for being awesome. Sure, we do those things anyway, but I try to point out the reason for a particular treat so that my kids know that their sweetness was noticed. Perfect example: in the pic at the beginning of the post, we had already been inside a T. J. Maxx/Home Goods combo store for an hour, but my kids were still hanging in there because a) they’ve had a LOT of practice with this at this point and b) they knew our next stop was Pet Smart to check out all the fun animals IF they made good choices. Did I have to remind them of this fact a time or two? Yes, but only a time or two. Which is fine by me. I’m not expecting perfection. Just progress. And now, if you’ll excuse me, we have an errand to run (and a picnic afterwards to pack for). Any tips you’d like to add? I definitely don’t claim to have it all figured out, but I can honestly say that the things in this post have saved many a trip out in public with my children and that–while I would prefer to grocery shop at my leisure any day of the week–I don’t dread going out with my children and genuinely enjoy seeing them grow in responsibility and kindness towards their siblings and others. They’re pretty rad little humans, if I do say so myself. That is some awesome advice! I have 4 kiddos 6,4, 2.5 yr old twins. We too live far from good shopping destinations. What do you do when the kids need to use the restroom? Do all 6 file in? Currently that’s what we do- take up the handicap stall and take turns going potty. Any advice? When do you do these errands? Morning? Afternoon? I feel like more than 2-3 short errands usually fills up a time slot quickly before the wee ones are due a meal. I’m all for snacks on the go, but I prefer meals to be eaten at home or at least around a table or blanket outside most of the time (as opposed to eaten on the go or in the car). I only have 2 but I’m filing this away for later. Hi Keri! Sorry to take so long to respond, but the answer is that we do them whenever we’re in town. Sometimes that’s in the morning. Sometimes, it’s after naps in the afternoon. It just depends. And, while I would prefer all meals eaten at home, sometimes we do eat on the go because it means that we won’t have to do the lunch rigamarole when we get home, and we can just throw everybody in bed for naps. I only have 2 kids, but at 1 & 3, errands are an adventure! I find the best thing is to have them actively participate. They pick which apples we’ll buy, tell me the colors and shapes and names of stuff, etc. That makes it more interesting for them, and I enjoy having them with me as company. I do still despise the loading and unloading from car seats! My biggest challenge right now with my one little is that he refuses to stay in the shopping cart! He either wants to be held all the way through the store or walk himself. If he walks, it is difficult to get him to continue holding my hand because he wants to explore. Any suggestions for keeping him in the cart? I try to give him my purse or wallet to go through since it is something he usually doesn’t get to play with, but that only entertains him for a few minutes. I’m SO sorry to take so long to respond, but I promise that I’ve answered you in my head about 20 times. I’m afraid you won’t like my answer very much, though. You ready for it? Persevere. Yup, that’s what I’ve got. I have definitely encountered what you’re talking about…with every kid, in fact. And honestly, while it’s all well and good to do everything in your power to distract/engage/entertain them, when/if all of that fails…stay the course. Simply say as calmly as you can, “You have to stay in the basket while we’re in the store. Mama can walk, but you may not.” And then hang in there (sometimes literally…I’ve definitely spent almost entire trips half-hugging them as I lean over and push the basket, holding them in place at the same time). Will they whine? Fuss? Throw tantrums? Yes. But, eventually (depends on the kid how long it takes), every one of mine finally got the message that this one is non-negotiable until I’m older. You can always reward them when they do better, but my main advice is don’t give up! Thanks for the reply! I did finally make it to Target by myself this week and it was wonderful! I know it will get easier someday! Shopping is SO much easier now that I have older kids and not just little ones, but I too used to shop with 4-6 under 11. We also live 30 minutes from the stores, so it was always a long day. I reduced my trips as much as possible, shopping every other week or so, but my biggest trick was to shop over lunch hour. We would bring/buy/grocery shop for a lunch and hit a nice park. I’d plan for probably a good hour there, eating not-so-everyday food, and then running their legs off. We all really loved those days. I stocked my van with picnic supplies and a big picnic blanket, and we were ready for anything. : ) If I HAD to shop on a not-so-nice day I might hit a McDonald’s play place and buy ice cream cones or a snack of fries to “pay my way”. We also had a home center that had a fantastic indoor play set for a few years. My kids still mourn it’s loss. : ) My goal was to have an opportunity for noise and action about mid way through a trip. If it couldn’t work out due to time or weather, my kids knew more good times were coming up and held on for the long haul. It ended up being a lot of fun! My only advice would be , start taking them out as soon as you can after they are born. They just get use to it, and then it’s just part of life. My youngest is now 13, and I really do miss the days of having my little buddies go everywhere with me. Really enjoy reading your posts….you MUST consider writing a book….any genre would do. You have a real God-given gift in this area. Thanks for the tips and encouragement! My nemesis is unbuckling and buckling everyone back into their carseats! Thus I have been taking the time (and patience) to teach my older two to do as much of their own loading and unloading as possible and encouraging helping each other and learning to close the van doors. I enjoy their company in the store most trips and it gives me an excuse to talk to myself! My big fat tip is making sure everyone (including myself) goes potty before leaving. If we’re lucky, we might make it through a few hours of errands without having to use any public restrooms. Wootyhoo! Staying home all day is just not an option for me, i have to get out of the house!! Thanks for the tips! You should do a post about how to maintain a clean house! I actually like running errands with my three too. One of the biggest things I’ve learned is just to allow us to take our time. Talk about what we are doing. We also plan for a snack or too, especially if we are grocery shopping. They can pick out a piece of fresh fruit or enjoy a free kids’ cookie. Lastly, I try to end with something we are looking forward to, either having a picnic lunch at the park or stopping for a quick visit at the science center (our family membership was an incredible investment!). I second the whole being well rested and well fed comment! That has made a world of difference for my 3 daughters. Also, I’ve always just taken them all everywhere, so they’re pretty used to it by now. They like talking to people and seeing what’s going on at the stores, etc. I am sure y’all practice this, but I always made sure all of us were well-rested and started out well-fed. Mine loved to manage the list when we went to the store…it took a little longer but made for a little less whining! Love these tips! I have four children and am very easily distracted (even if I’m by myself! ), so I’m always dreading having to take them with me, but this was like a breath of fresh air that it CAN be done. You may have already written a post on this, but I was wondering what items are your go-to or weekly regular food items for groceries? I tend to buy a lot of the same food every week/month and I enjoy reading what others with small children are buying/cooking. So I’d love a “week in the life” type post in the PANTRY and kitchen Love your blog and always love the advice you give me.